Did you know it’s possible to experience exhilaration and stark terror simultaneously? Jo and I were in our Jeep Wrangler in Custer State Park. 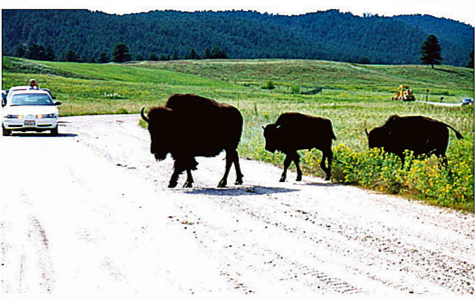 It’s home to a huge (1300 strong) herd of bison. After a 1-1/2 day search we gunned the jeep down a gravel road toward a dust cloud. There were just a few vehicles parked on the road viewing the huge herd grazing in the meadow. It started slowly – they began to cross the road – daddy, momma followed by a calf. All at once the entire herd began walking toward us. I shouted to Jo, “Get in the jeep” and we ran for cover. In an instant we were surrounded. I thought my heart was going to pound out of my chest when Jo said, “I hope nobody honks their horn or scares them, we would be goners”. What a terrifying feeling. The pace picked up. The top was down but we didn’t dare reach outside. These beautiful, massive creatures were passing mere inches away. To the right all I could see was bison, some larger than our little jeep, bearing down on us. The left side view consisted of buffalo butts – not pretty. As the last of the herd crossed the road we breathed a big sigh of relief. Tears were streaming down our cheeks. 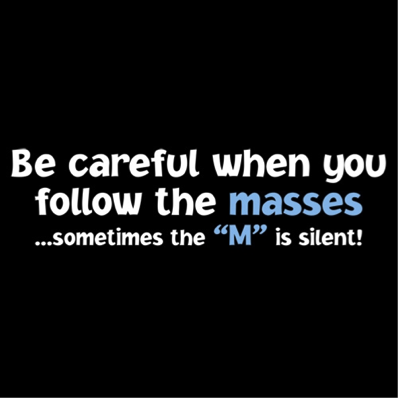 “Following the herd” is much more than a figure of speech. It can be a heck of an exhilarating ride that could instantly end in disaster. Since the first bailout bill in 2008, interest rates for solid, safe fixed income investments have plummeted to the point that a third of the world’s developed market sovereign debt has negative yields. “Although the experience with negative nominal interest rates is limited, we tentatively conclude that overall, they help deliver additional monetary stimulus and easier financial conditions, which support demand and price stability. Yield starved investors jumped into the stock market despite the difficult economic conditions. 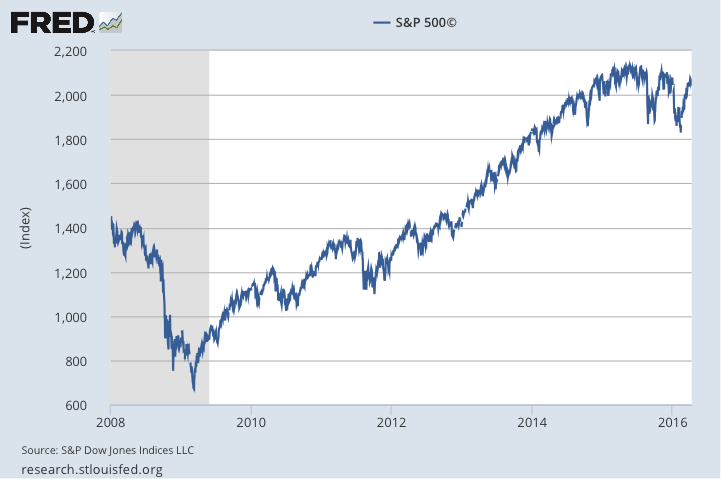 The S&P 500 index tripled from the 2009 low. 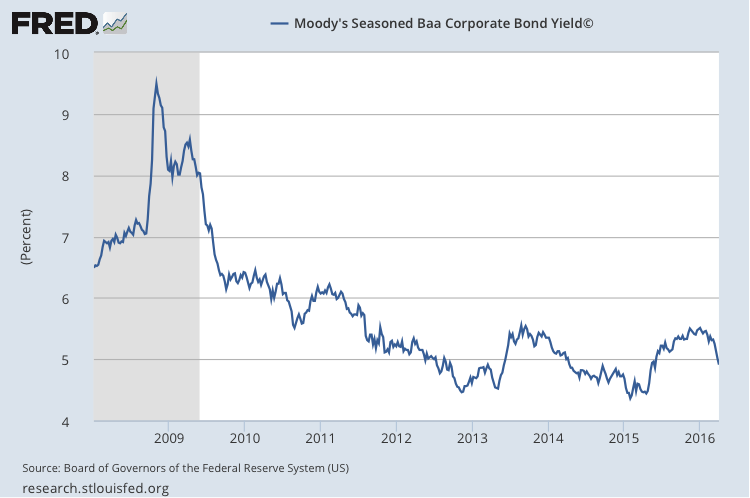 Individuals and institutional investors alike, fearful of a major market correction, weighed the risk of a shaky stock market versus (Baa and below) “junk” bonds, known for a higher rate of default. Billions flowed back into junk bonds. Yield, which had been increasing since the Fed raised rates, quickly reversed as demand skyrocketed. Those who got there first got the best morsels. As the herd moved in, yields dropped. Investors wanting safety from default looked to the government, despite the low rates currently offered. Recently I wrote about the potential for negative rates in the US. Markit.com tells us “TIPS (Treasury Inflation Protected Securities) ETFs (Exchange Traded Funds) see record inflows as investors pile in.” They’re not buying TIPS for inflation protection; but rather chasing what little yield there is available. It’s better than nothing or negative rates. Currently the best interest rate available for TIPS with 10-year maturity is .212%. A ten-year treasury pays 1.72%. Buyers forego 87% of the guaranteed interest; betting inflation over the next decade will make up the difference. ETFs tracking TIPS are supposed to replicate them by using their Colonel Sanders secret recipe of herbs and spices. If the herd runs for the exits, those holding these ETFs face a huge risk of loss due to a massive sell off, in what could become an illiquid market. Here’s a sad little secret. The Fed’s goal is to increase inflation. What happens if they overshoot their goal and we have high inflation like the Jimmy Carter years? At a recent Money Show I entered four different booths of name brand money management firms hawking their wares. These dapper young folks all bragged about their allocation formulas for ultra-conservative to high-risk investors – and anything in between. When I asked, “How are you protecting your clients’ portfolios from high inflation?” Without hesitation, they all said “We can allocate a portion to TIPS”. TIPS protect the money you have invested in them. They do not provide an umbrella effect. They won’t help make up the slack for the rest of the portfolio. I asked about gold and silver. They all said it is much too risky, implying they could get sued. Much like today’s medical industry, big brokerage firms are practicing defensive money management. If they are sued for malpractice, their defense is all the reputable firms are doing the same thing. If all the brokerage firms herd their clients into the same pen, it’s considered safe principles. Despite intense opposition by brokerage and asset management firms, the Department of Labor issued new rules for those who manage retirement money. The higher standard (fiduciary) gives the consumer much greater protection should they sue their money manager. While that is a good thing, looking outside the box for opportunities will be even harder because their legal department will frown on it. What does this mean to the individual investor? The Fed is herding like cowboys, by limiting choices, involving higher risk. If investors opt for dividend yield or risky bonds and the market collapses, they could lose their money and live in poverty the rest of their life. Should they opt for safety, the yields may be so small (if not negative), they may not be able to pay their bills. The government loves to issue low to negative yielding bonds. Being in a herd creates the illusion of safety. If you follow the herd in either direction, the view never changes, you don’t know what’s ahead and you have good reason to worry. The National Geographic Channel aired a neat show about a herd of wild horses they tracked for several years. The star was a young colt that grew up to be a beautiful stallion. Tired of fighting with the other males for breeding rights, he sweet-talked three mares to ride off into the sunset to start a herd of their own. Individual investors must think and act independently; protecting your life savings with the ferocity of a mama lion protecting her cub. Investments must meet your needs; regardless of what everyone else is doing. Burn the candle at both ends. Having a portion of your portfolio invested in ultra-safe, low yielding investments is prudent. You can use this to fall back on if you need to. Be very selective; find what’s right for you. Beware of the big, green meadow. The big brokerage firms will get to the meadow with their own trading accounts well ahead of individual investors. Eventually the herd becomes so large it cannot survive in the field – and the big boys will be the first ones to leave. Scout on your own. There are plenty of terrific investment opportunities that are just too small for the big brokerage houses. Finding them requires time, education and patience; however good, safe under the radar investments are out there. Understand gold and silver. They are the one true money that is not the obligation of a bankrupt government. They have stood the test of time. Unlike stocks or bonds, they will never be deemed worthless. Know the warning signs. When you read that billions are flowing into a particular investment, proceed with caution. Billions of dollars were lost during the tech boom when investors jumped in late, following the herd because they didn’t want to be left behind. Be outside the corral. Desperate governments, fighting to maintain their power, will do everything they can to extract wealth wherever they can find it. It’s easier for them if it is all in the same corral. Invest independently where you and your money are under your control, not the government or central banking system. The big brokerage houses with their myriad of mutual funds blare that the little guy doesn’t stand a chance in the market. Their goal is to herd billions into their coffers so they can charge high fees even if you lose money. They may be right, however, there are many exceptions. An uneducated, disinterested investor is as vulnerable as Jo and I were in the middle of the bison herd; we could easily have been trampled. An educated, active and conservative investor is already well ahead of the pack with a much better view in front of them. It’s all a matter of choice. Recently Jo and I had dinner at a local Denny’s restaurant. Jo told me to look around and see if I noticed anything. Everyone was staring at his or her cell phone. While senior citizens like to complain, it was people of all ages including the seniors. Jo found an interesting article about a young man who went without his cell phone for a week. He makes some interesting discoveries. Colleague David Galland recently published data from a study concluding, “the average user actually checks their phone around 110 times day. At peak times (5-8:00 PM), the average person checks their device around nine times an hour. What’s the point of a family dinner if no one talks to each other? I knew of a luncheon group where they all stacked their cell phones on the table. If anyone reached for their phone prior to paying the bill, they had to buy lunch for the entire group. I was told, without exception, someone finally couldn’t stand it and would grab their phone…. Kind of sad when you think about it! Enjoyed the article once again.